Snoring and Obstructive Sleep Apnea – two highly prevalent sleep disorders, are caused by collapse of the upper airways during sleep. According to research and experience, one of the most effective therapies for snoring and OSA is to strengthen the muscles in the upper airway, thereby preventing them from collapsing while you are asleep. Playing a didgeridoo on a regular basis is an acknowledged and proven way to to strengthen the muscles in the upper airway. This not only reduces (or eliminates) your sleep apnea, it will also reduce daytime sleepiness and the risk of cardiovascular morbidity and mortality in the most severely affected patients. How to Play a Didgeridoo? To make a didgeridoo sing, you need to sit in a comfortable position so as to drone for a longer period of time, relax by having a drink to wet your lips and letting your lips loose and your breath coming easy. Hold it steady in a position comfortable for you. You can hold the end of the instrument with your feet if it is convenient for you. The way you play it depends on the style you’re comfortable with. You can either play it directly in front of your mouth or off to the side of your lips. Both ways have their benefits. Loosen your lips and blow through the instrument making your lips vibrate, just like a horse. Don’t be discouraged by the initial ugly noises you make! You’ll find the right note by tightening or loosening your lips. However, try not to hold your lips too tight or blow too hard. With the right vibration you get a low, rumbly note out of the didgeridoo. 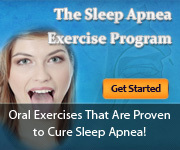 Get rid of your sleep apnea the easy, simple and hassle free way. Check out our Didgeridoo for Sleep Apnea Program (www.DidgeridooForSleepApnea.org) NOW!